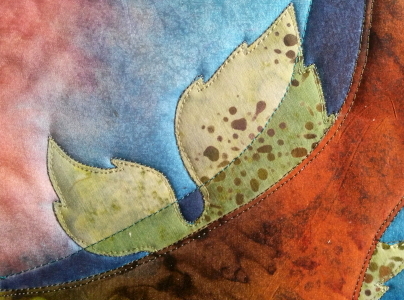 August Challenge Week 4 » What's Under the Needle? This week I plan to use 'shiny' as my word but I didn't really finish with my shadows from last week so now that I've had a bit more time to think about them, I've decided I might paint the shadows. I tried my Salvia Sticks but found they were not giving me the effect I wanted - I tested first! So I turned to ink. I used Fantastix inks by Tsukineko. In my test shown below, you can see the Salvia paint in the top right. It was very blotchy and hard to distribute on the silk - maybe I just needed to play with it a bit more but the ink worked much better. I chose two colors - midnight and celadon. 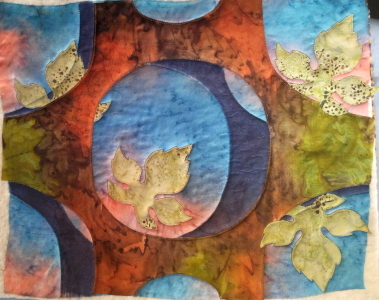 Midnight for the silk area and celadon for the leaves. 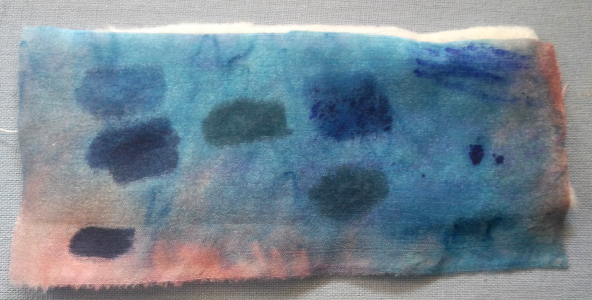 I knew the ink would run a lot on the silk so tested first and soon came up with a method that worked well. I inked in the middle of the shape and let it run toward the edges adding a little extra where needed. 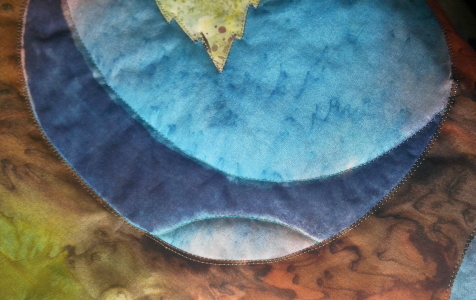 As it seeped to the stitching lines, I was pretty prompt in heat-setting it to stop it from running any further. The leaves being cotton didn't run nearly as quickly or as much. Of course, I do have the silk fabric which is shiny.... I could add some metallic thread... but where that it wouldn't draw too much attention? I decided to use a shiny rayon thread - not too shiny like a metallic thread, but still shiny enough. 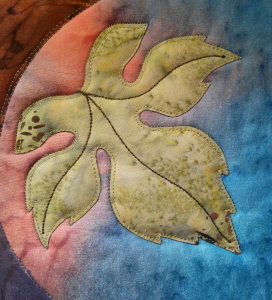 I used it to stitch in some veins on the leaves. Mission accomplished for this week!